September 18, 2018, 9:40 a.m. The results of a new YouGov Omnibus survey will make you want to avoid shaking hands for the rest of your life. The figures show that significant minorities of people do not always wash their hands after going to the toilet, with men in particular being the biggest culprits. We put multiple scenarios to the public, asking how frequently they washed their hands after urinating or defecating at home, at work and while out and about (e.g. out shopping). For men we also examined whether handwashing habits changed depending on whether they went for a wee standing up or sitting down. Fortunately, the majority of Brits say they always wash their hands in each of the scenarios we put to them. But even in the scenario where people were most likely to wash their hands (female workers, after having a poo at work), one in ten (10%) are still not always washing their hands afterwards. At the other end of the scale, the scenario in which people are most likely to admit they don’t always wash their hands is when men have a standing wee at home, at 35%. In fact, in all scenarios men are less likely than women to wash their hands. The biggest difference between the genders was over having a wee while out and about – 18% of women say they don’t always wash their hands in this circumstance, compared to 30-32% of men (depending on whether they are sitting or standing). The results also revealed Brits’ reluctance to go for a poo in some locations. 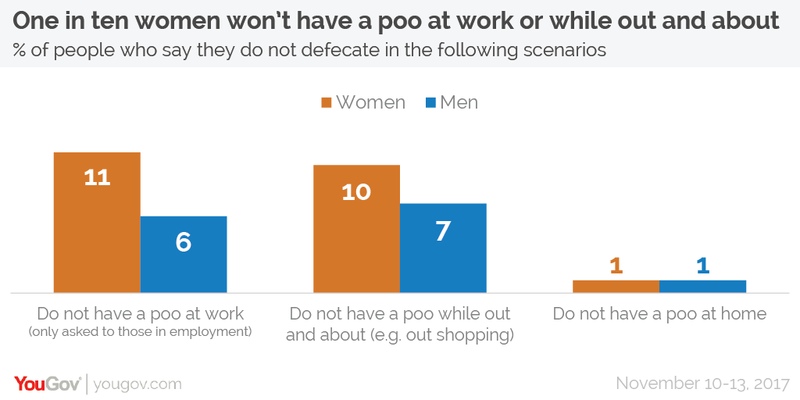 One in ten women are apparently unwilling to have a poo in public settings – 11% of female workers say they never defecate at work (this figure was 7% among male workers), while 10% of women say they don’t poo while out and about (6% among men). There was no such reluctance when it came to urinating in these situations. A certain section of men are also dead set against sitting down for a wee, with between 13-21% (depending on location) saying they never sit down for a number one. It might seem strange to be so opposed to sitting down to wee, but it may be that the act to some people has negative connotations. In fact, in Germany a man who sits down to urinate might be branded a “sitzpinkler” – the word literally refers to a man who sits down to urinate (‘like a woman’), with the implication being that they are under the thumb of their partner or otherwise weak or effeminate.